HB Javorius Allen vs. LB Myles Jack – While Allen has not looked great running the ball, through two games he has flashed the receiving skills that we saw his rookie year. His 72.8 receiving grade ranks 19th among running backs and he’s averaging a solid 1.59 yards per route run. Jack has the fourth-highest coverage grade among all linebackers (87.8) and is averaging 12.2 coverage snaps per target, seventh best among linebackers. 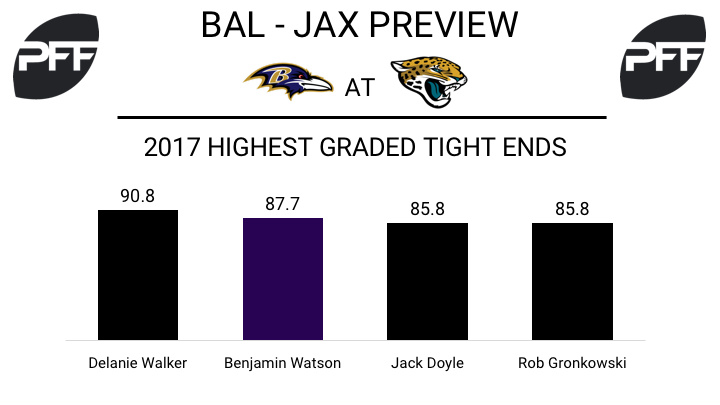 TE Benjamin Watson vs. LB Telvin Smith – Smith is another Jaguars linebacker who has been strong in coverage this season, earning the 15th best coverage grade among linebackers through two games (80.9). At age 36, Watson has shown he can still play, grading as the second-best tight end so far (87.7). Watson leads all tight ends in yards per route run with a 2.94 average. He’ll look to keep his high-level play going against Smith and a strong Jaguars defense. QB Joe Flacco vs. CB A.J. Bouye – Whether he’s looking for WRs Mike Wallace, Breshad Perriman or Jeremy Maclin, Flacco should look to get the deep ball going this week. He has just two attempts on the year of throws traveling 20-plus yards in the air, and one of them was an interception. By this time last year, Flacco had attempted 12 such passes for 176 yards, two touchdowns and one interception. Bouye has allowed 116 yards on the year, tied for 16th most among cornerbacks. He is allowing an average of 16.6 yards per reception, 10th most among cornerbacks with at least five receptions allowed. RB Leonard Fournette vs. DI Michael Pierce – While game flow didn’t help matters in Week 2, the Jaguars showed that getting Fournette touches is still their focal point offensively. Through two games, Fournette has an overall grade of 68.3 and has forced 7 missed tackles with 99 of his 140 yards coming after contact. The Ravens will be counting on Pierce to help stop the run. Pierce’s overall grade of 83.7 ranks 15th among interior defensive linemen through two weeks, and his run defense grade of 80.4 is 23rd out of 109 qualifiers. T Cam Robinson vs. EDGE Terrell Suggs – Through his first two games, Robinson ‘s overall grade of 41.1 ranks 58th among qualifying tackles, but his pass-protection grade is slightly better, checking in at 46.1. On 60 pass-rushing snaps Robinson has allowed six total pressures, giving him a 92.1 pass-blocking efficiency that ranks 48th among 71 qualifiers. 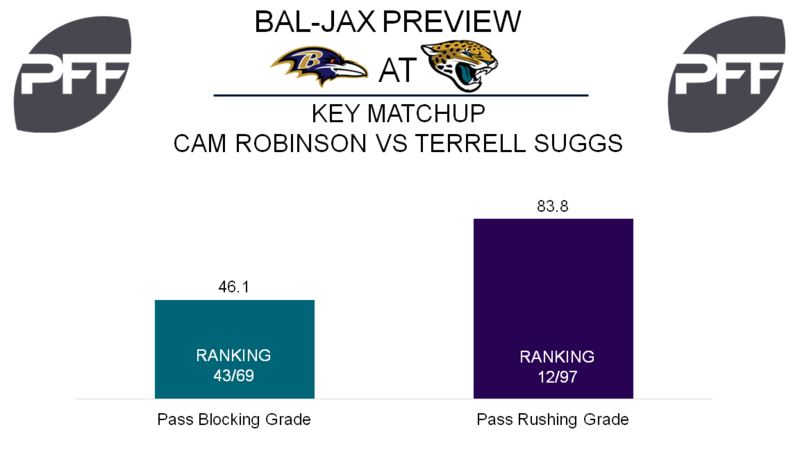 Robinson will be facing a veteran in Suggs, who has an overall grade of 82.2 that ranks 19th among edge defenders, while his pass rushing grade of 83.8 checks in at 12th. On 58 pass-rushing snaps, Suggs has produced ten total quarterback hurries which gives him a pass-rushing productivity of 14.2 that ranks 14th among edge defenders. 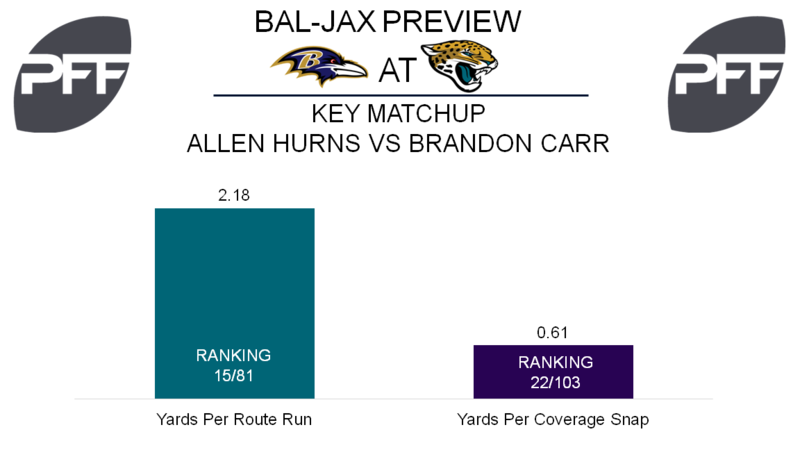 WR Allen Hurns vs. CB Brandon Carr – After a disappointing 2016, Hurns has bounced back nicely these first two weeks. While his overall grade of 82.0 ranks seventh among all receivers, Hurns has also impressed with his 2.18 yards per route run and a passer rating when targeted of 143.9 that is sixth among qualifiers. This week Hurns figures to see a lot of Carr, whose coverage grade of 79.7 is the highest among Raven corners and ranks 25th overall. Carr has allowed 0.61 yards per coverage snap and has only given up a reception once every 17 cover snaps. Both are top 25 figures among qualifying corners.